An Intellectually Rich and Challenging Exploration of Modern Jewish Theology "How we deal with revelation determines how we handle the issue of authority in belief and practice. How we understand authority determines how we deal with the claims of the tradition on us; how we deal with those claims determines how we shape our own Judaism. That conclusion opens the gate to a reconsideration of all of Judaism's theology, in particular how we understand God, for God is at the heart of Torah." 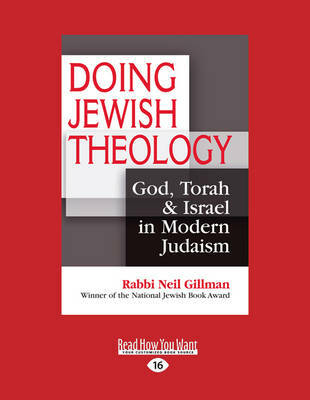 - from the Introduction With clarity and passion, award-winning teacher, author and theologian Neil Gillman captures the power of Jewish theological claims and reveals extraordinary insights into Jewish identity, the purpose of religion, and our relationship with God. Drawing from Judaism's sacred texts as well as great thinkers such as Mordecai Kaplan, Abraham Joshua Heschel, and Paul Tillich, Gillman traces his theological journey over four decades of study, beginning with his own understanding of revelation. He explores the role of symbol and myth in our understanding of the nature of God and covenant. He examines the importance of community in both determining authority and sanctifying sacred space. By charting the development of his own personal theology, Gillman explores the evolution of Jewish thought and its implications for modern Jewish religious identity today and in the future.